When using SplineAreaSeries the data points are connected with smooth line segments and the area enclosed by the line and the coordinate axis may be optionally stroked and/or filled as shown on the image below. SplineAreaSeries class inherits from the AreaSeries class - See the inherited properties. 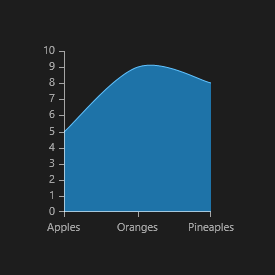 Here's an example of how to create a RadCartesianChart with SplineAreaSeries.